A new study from video monetization company FreeWheel today reveals that the mobile video market grew from 2 percent in 2011, to 12 percent of overall online videos watched in 2012. That’s a huge increase, and the main benefactor of that jump is Apple, whose iOS mobile OS grew its share of total mobile video views to 60 percent, compared to Android’s 32 percent take of all mobile views. Both platforms experienced considerable gains in terms of overall video viewing volume, with 30 percent growth in viewing of online videos on non-PC/Mac devices occurring between Q3 2012 and Q4 2012 alone. Apple’s strong lead is dues to its dominance in the tablet market, where FreeWheel says Android has yet to field a competitor that can truly make a dent in its overall share. The iPad accounted for 24 percent of the overall iOS total, with the iPhone taking 30 percent and iPod touch devices accounting for the remaining 6 percent of its overall share. FreeWheel didn’t break out Android smartphone vs. tablet traffic, and instead just noted that tablet traffic was minimal. Apple stretched its lead over Android considerably between Q3 2012 and Q4 2012, which would suggest that the iPhone 5 in particular had a strong impact on mobile viewing. Apple’s growth could also include traffic spikes from the new iPad mini and iPad, though those were in constrained supply for much of the last quarter of 2o12, which means it’s possible we’ll see more share growth through the first quarter of this year to reflect continued strong iPad sales. 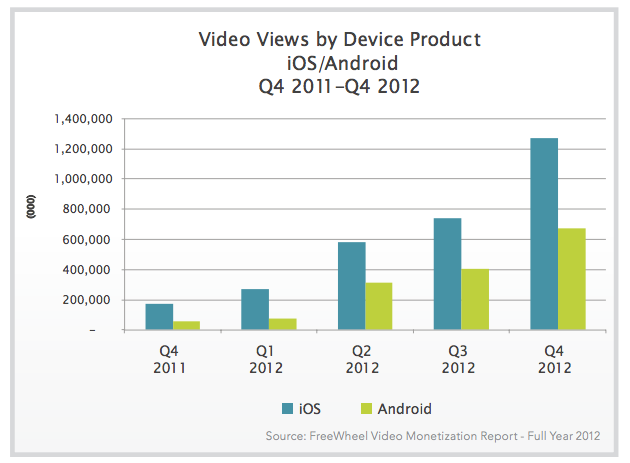 For Apple, owning a majority share of mobile video views as the trend towards viewing on tablets and smartphones continues to spike means that it has more influence over the type of content and advertising that gets shown, which should ensure that developers tailor those experiences for iOS first, and then for other platforms second. That’s yet another of the more subtle platform advantages that Apple maintains over other competing mobile players, which is often hard to quantify but gets reflected in user experience.